A maintenance release of MSI Kombustor is available. Both 32 and 64-bit versions have been updated. 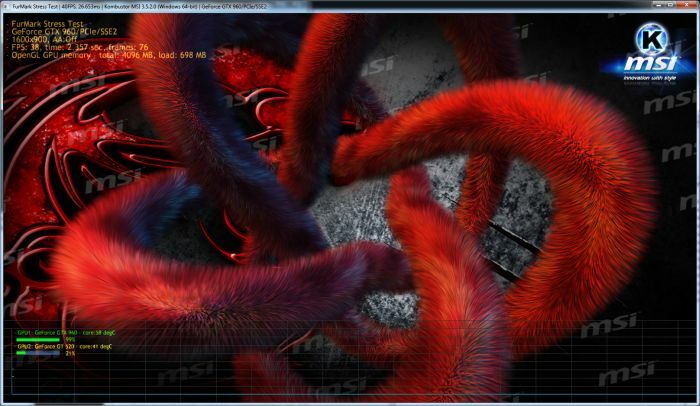 AMD Radeon owners: MSI Kombustor requires the PhysX support for some tests. 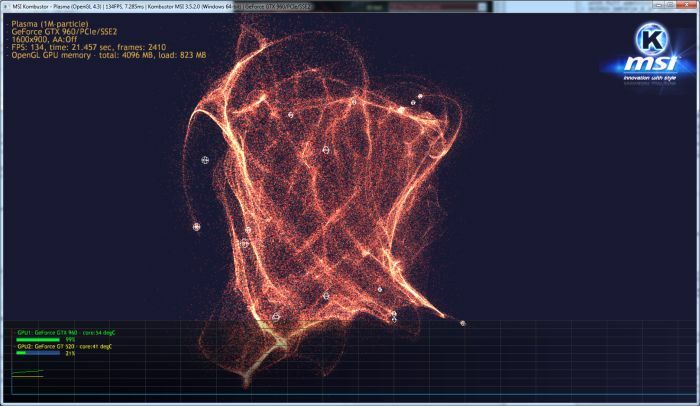 If PhysX runtimes are not present on your system, Kombustor will not start properly. 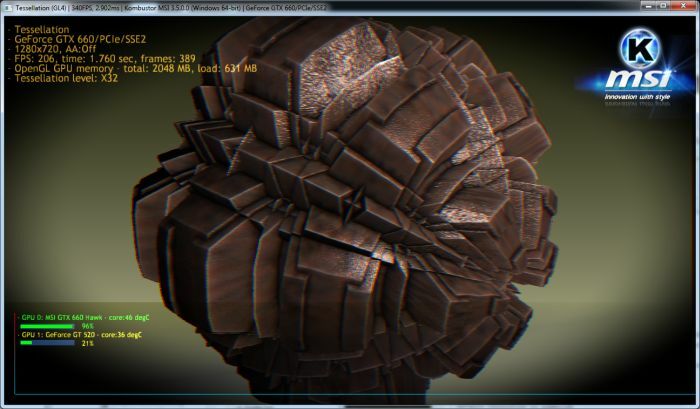 You can download latest PhysX runtimes from THIS LINK. 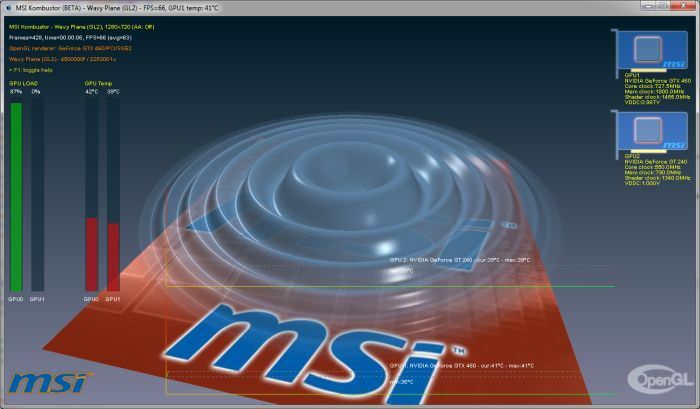 MSI Kombustor v3.5.2 improves GPU memory stress test module on NVIDIA graphics cards (the GPU memory is correctly allocated) and tests up to 12GB are available (not tested with 12GB of VRAM so let me know if it works or not). 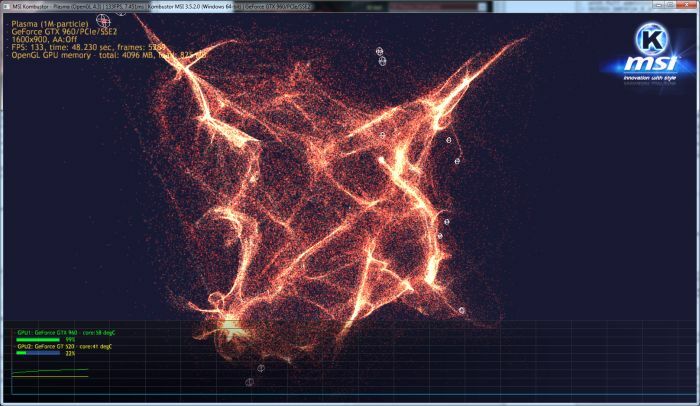 PhysX 3 fluid simulation demo have been improved with better simulation parameters (the simulation is more stable). The support of recent NVIDIA GeForce and AMD Radeon GPUs has been added as well. A comparative score table is available HERE for some tests. The online score database can be found HERE. (a Radeon R9 290X was displayed as a R9 390X). 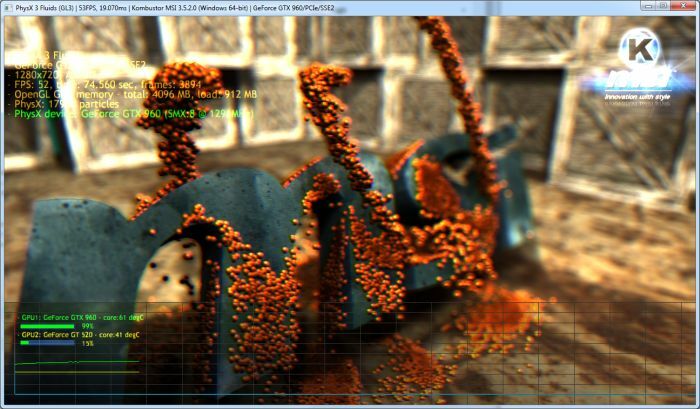 - updated OpenCL Julia4D test for Radeon R9 290X + Catalyst 15.7. 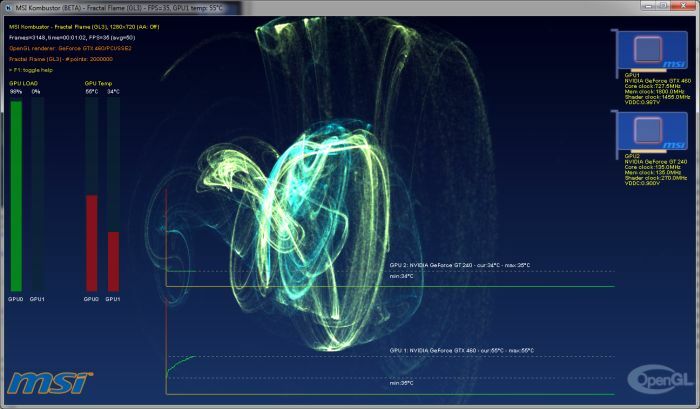 - improved Plasma demo effect (added more viscosity). 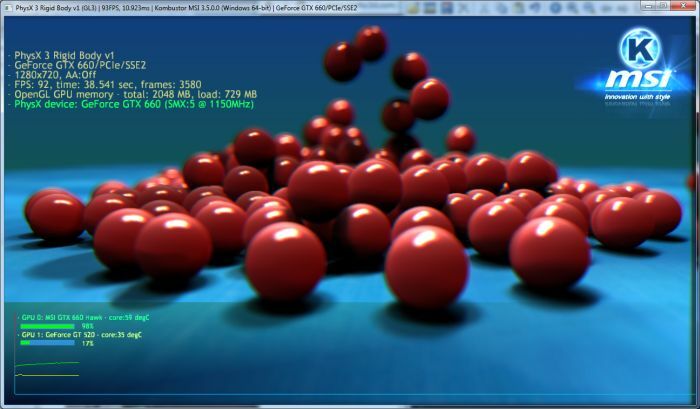 - added new memory burner tests: 4096MB, 6144MB and 12288MB. 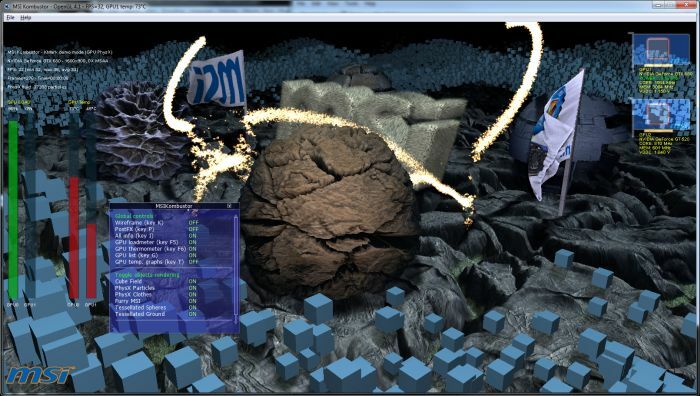 - fixed memory burner stress tests. Now GPU memory is correctly allocated. - added support of latest desktop GeForce (GTX 960, GTX 980 Ti and TITAN X). - added support of latest notebook GeForce (GTX 980M, GTX 970M, GTX 965M, GTX 960M and GTX 950M). - added Radeon R9 Fury X, R9 390X, R9 390, R9 380, R7 370, R7 360, R7 350 and R7 340 support. It reports my 290X as a 390X during stress test. 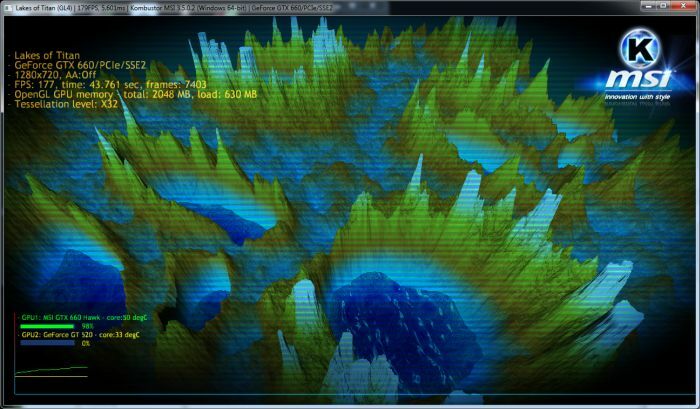 Thanks for the feedback, I updated the GPU monitoring code (v3.5.2.1) and it should be ok now. Hii i am a big fan of this page for a few years now. i just move from win 7 to win 10 64 bits and before my total points in the 1 million parts was 24000 points more or less but yesterday i installed and run the kombustor and my for my surprise i just get 8000 points with 2 780 oc on sli so i believe something wrong is happening or maybe the kombustor its not ready for win 10 64 bits build 10240 just want to let you know. Thanks for the feedback. I’ll try to do some tests asap. I let you know. well looks like you guys doesn’t find what is the problem with this kombustor , just an up date I’m using Nvidia 355.82 and the same bug is present in sli I cant pass 130fps and only 8000 points, not matter what driver I use, but I’m pretty sure is something with windows 10 64 bits could be your kombustor is not ready for win 10.
launches UI and is navigable but when i choose a test it freezes once the loading bar is full (on any test) and i have to end process. What could be wrong if the app doesn’t run? It’s being silly closed within 1 second. Can I use this with Asus graphics card as well or is it just MSI exclusive ? 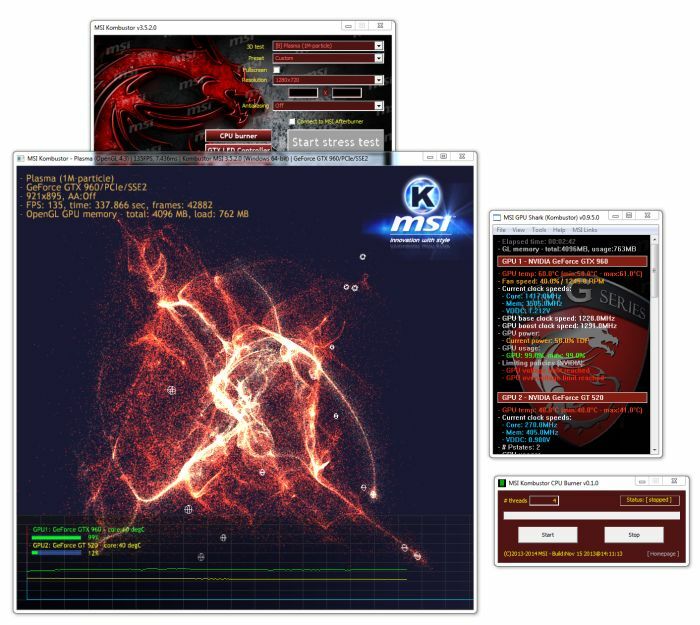 Yes you can use Kombustor with any graphics card vendor, it’s not locked to MSI’s products. Hi, it keeps testing my Intel card and not my nvidia card and I cant seem to fix this. Any idea why? Cheers.